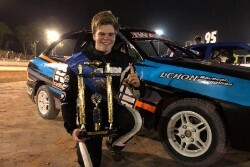 Blake Iwanow has had a perfect weekend at the Albany Speedway and in the process claimed his first WA Junior Sedan Title, emulating his Uncle Ricks efforts from some twenty years earlier. Iwanow was dominant all weekend, winning all four of his heat races to start the twenty five lap feature event on pole and then lead every lap to claim his first WA Crown. As the race went green for the first time it was Iwanow who immediately jumped to the lead over fellow front row starter Kayne Dellar and Darryl George, with Matthew Thomson also fighting hard in fourth. Unfortunately it did not last long as Jesse Steele and Jared Coutts came together, Coutts spinning and Cody MacKellar and Brody Day also getting involved. This would set up a complete restart with Steele sent to the rear while MacKellar was unable to rejoin. The second attempt saw Iwanow streak away quickly as Thomson moved into second as George and Dellar fought for third. With one lap complete Coutts found himself facing the wrong way in turn one, with Taj Vanzetti and Hayden Mortimer also coming into slight contact with the stranded car, bringing out the yellows and setting up a single file restart. Iwanow led away quickly while Thomson moved clearly into second and Dellar chased hard in third. George was settled in fourth while Luke Malcolm and Brandon Buszan were side by side for a number of laps for fifth place before the yellows came on for another spun car. Again Iwanow led Thomson and Dellar away with George, Luke Malcolm and Taj Vanzetti rounding out the top six. Vanzetti then made the move on Malcolm to grab fifth place on lap seven, with Brandon Buszan quickly following him through and looking for a way past Vanzetti also. The yellows then came out with nine complete as Kurtis Blackburn found himself facing the wrong way in turn one after hitting the front straight wall, bringing his race to an end. Still Iwanow held his cool, racing away from Thomson and Dellar on the restart, while Taj Vanzetti made the moves on Darryl George and grabbed fourth on lap eleven, closely followed by Buszan yet again. Back in the pack cars were four wide with Mitchell Baker on the inside and running out of room, spinning in turn three and bringing out the yellows once again. Once again Iwanow led Thomson and Dellar, with Vanzetti closely behind in fourth. On lap fifteen Vanzetti went to make a move but dropped low on the back straight, losing valuable ground while behind him Buszan and George were fighting for fifth. By this stage Iwanow had extended his lead to 2.4 seconds over Thomson, with Dellar and Vanzetti both in striking distance of Thomson in third and fourth respectively. Iwanows lead was nearly five seconds with five laps to go, then six seconds with three remaining. With two remaining Iwanow closed on lapped traffic, but it did not slow him at all, as well behind him a four car battle occurred for second place, with Thomson slowing in the final corners and Dellar, Vanzetti and Buszan all getting through in the final lap. Iwanow would officially win the race by over eight seconds from Dellar, while Vanzetti charged through from thirteenth to finish third, with Brandon Buszan and Thomson rounding out the top five. The WA Titles continue next week with the WA Street Stock Title to be held across the Australia Day weekend at the Make Smoking History Collie Speedway. A Main, 25 laps: 1. W24 Blake Iwanow, 2. W95 Kayne Dellar, 3. W15 Matthew Thomson, 4. W73 Darryl George, 5. W19 Bradley Short, 6. W198 Brandon Buszan, 7. W77 Jared Coutts, 8. W22 Luke Malcolm, 9. W66 Seth Hinsey, 10. W108 Blake Webb, 11. W12 Jesse Steele, 12. W195 Lachlan Dellar, 13. W121 Taj Vanzetti, 14. W9 Mitchell Baker, 15. W84 Beau Oldfield, 16. W171 Kurtis Blackburn, 17. W18 Hayden Mortimer, 18. W8 Brody Day, 19. W63 Bryden Southwell, 20. W17 Cody MacKellar.